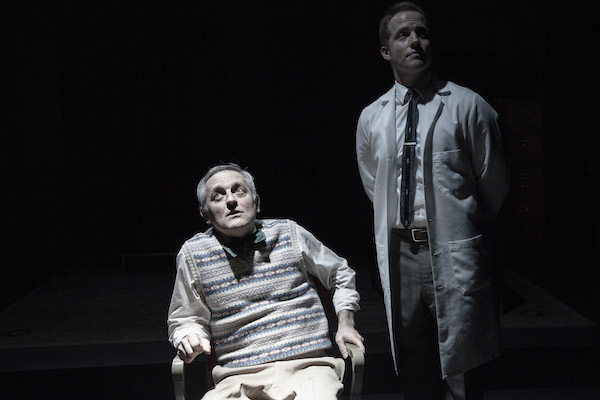 For their second opening night Antaeus Theatre Company (Ducks cast) presented a wildly buoyant version of Harold Pinter’s full-length tragicomedy, The Hot House. The lunatics are running the nut house and its anyone’s guess what all the shenanigans are going to conclude for the staff or the inmates. One thing is clear, something positively sinister is going on under the cover of perfunctory administration. Institution director, Roote (and his sanity), is being undermined by his subordinates. When a patient is murdered and another raped, resulting in a pregnancy, Roote orders the perpetrator(s) found. The glitch is, it appears the perp is Roote himself. 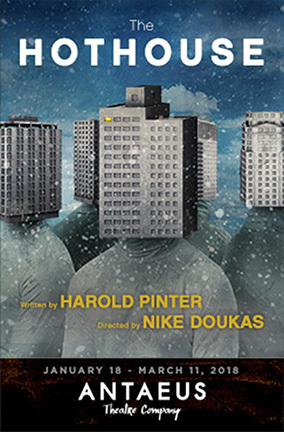 Written in 1958, Pinter put aside this subversive look at a government-run mental institution rampant with unchecked power and where the wardens are madder than the inmates, following the initial commercial failure of The Birthday Party at the Lyric Opera House (now the Lyric Hammersmith), in London. It wasn’t until 1980 before he revisited the work and directed the first production, which opened on April 25 at the Hampstead Theatre. In 1995, Pinter himself played Roote in a production staged at the Minerva Theatre in Chichester, which later transferred to the Comedy Theatre in London. By far and large, Hot House, directed by Nike Doukas (Read the Director’s Note), is Antaeus Theatre Company’s greatest theatrical accomplishment since opening The Kiki & David Gindler Performing Arts Center in Glendale. And when we say, perfect, it is most definitely NOT an understatement. Each and every sentence, every word, down to the inflections, every stage direction, lighting cue, sound cue, use of a prop, body movement and emotional register by the actors was, in a word, dazzling. Not to be outdone is the set itself – a masterpiece in chilling simplicity – as is the flawless costume design by Julie Keen. It’s not often that a production comes together in such superior precision. Yet here it is. Endowed with recognizably some of Antaeus Theatre’s best talent, this cast includes Peter Van Norden as Roote, Graham Hamilton as Gibbs, Jocelyn Towne as Cutts, JD Cullum as Lamb, Rob Nagle as Lush, Paul Eiding as Tubb and John Apicella as Lobb. Especially, impressive was the incomparable performance by JD Cullum tricked into undergoing torture for the sheer pleasure of the resident doctors. 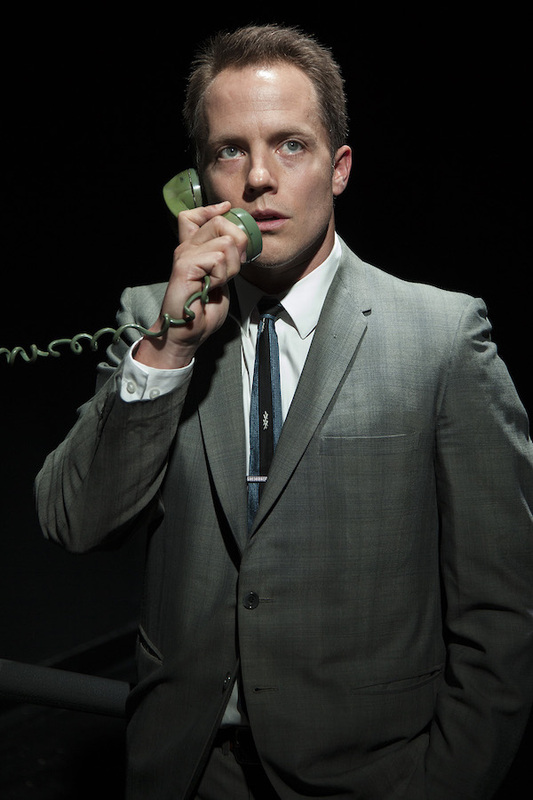 Before our eyes, by a literal device switched on and off, Cullum as Lamb, emotionally split-second-shifts back and forth from awkward, sweet and unassuming to mind-fissured angry and later, ghastly insane. Van Norden as Roote, the Head of the Institution is as absolutely over-the-top as Graham Hamilton is grisly as Gibbs and Towne (Cutts) and horrifyingly so with Robb Nagle (Lush) and Paul Eiding (Tubb) rounding some of the most hilarious whatabouts in the play. Hothouse in the hands of the Antaeus cast with Doukas at the helm is absolutely impeccable! Extraordinary…Scenic Design by Se Hyun Oh, Lighting Design by Ginevra Lombardo, Props Design by Erin Walley, Fight Choreography by Bo Foxworth, Sound Design Jeff Gardner, Costume Design by Julie Keen. Dialect Coach is Lauren Lovett-Cohen. Production Stage Manager is Jeanne Valleroy. Jocelyn Towne, John Apicella, Rob Nagle, and Peter Van Norden.